*DISCLAIMER* – I am putting all the edge rushers in this group. If I think the player is a primarily a pass rusher (whether it be OLB or DE) he will be in this group, no matter the size. **A note about Pro Upside Comparisons: These are comparisons that are based on the player reaching his ceiling. It does not necessarily mean I believe the player will “be as good as”. We still have to say this group is a strength of the team no more. Gone are the days of NYG having “too many” quality edge rushers. The pass rush did improve in 2014 from 2013, however and there is reason to hope this can be a quality group if things line up and they all stay healthy. JPP was franchised and is fully capable of being a top 10 DE in the game. His performance against the run goes overlooked, he really is a true three down player. Ayers was arguably the best NYG defender in 2014, showing left/right and inside/outside versatility. When I talk about presence, approach, and attitude, Ayers is a perfect example of what this team needs more of. I think Moore has been under-utilized throughout his young career and his has he potential to be a very disruptive player. He may be a bit of a liability against the run, showing a lack of anchor-type strength but he is a tough guy to block off the edge on passing downs. He needs more snaps. Wynn showed promise in preseason 2014 and finally got a few looks late in the season and produced. Selvie was brought in to rotate with the guys mentioned above. The light has turned on for the tools-rich edge rusher and can easily be a 8-sack guy every year if the snaps are there. Stanton is a training camp body. Strong Points: Versatile edge player with the tools and skills to be moved around all over the defense. Has the short area explosion and turns speed in to power on a whim. Bendy and stout at the same time. Can get under the blocker’s pads with force and all of his balance. Has the speed in space to run with backs and receivers. High effort, aggressive nature that plays hard through the whistle. Pursues to the sidelines and shows the functional speed and strength to factor all over the field in any role. Heavy hands and powerful leg drive. Has an array of rush moves that appear natural for him to use. Weak Points: Technique and mechanics have flaws every time I see him on tape. Inconsistent presence and approach. Struggles to recover after being beat off the ball. Won’t disengage from the more powerful blockers. Timing off the snap isn’t always there. Limited exposure in coverage, may be a downhill-only type player. Light in the pants, needs more weight below his waist. Summary: Junior entry. All American season in 2014. Won the team’s MVP award in 2014 as well. Turned in to the feature player on this defense once Dominique Easley went down with an injury in 2013. Easley is a disruptor off the edge that played standing up and with his hand in the dirt. Fowler lost over 20 pounds over his three year career with the Gators and it looks like that may one of the main reasons he broke out in a big way this past season. He is a lot more explosive and fluid when he is playing at or below 260 pounds. His best role is at outside linebacker in a 3-4 front where he can be turned loose and blend his short area power and explosion. He will need to improve his approach from a mechanical perspective and he could use more lower body strength, but he is an immediate impact guy on the edge. *Fowler isn’ the athletic freak that some make him out to be. He really gets by on grit, hustle, and a level of aggression that a lot of players don’t have. His production in college was back and forth because of his constantly-changing role and body. He was 20 pounds heavier at one point, putting his hand in the ground and playing inside gaps at times. In 2014 Fowler found his best role with 20 pounds off his frame and he’s now a top 10, possibly top 5 prospect. He can play DE in a 4-3 but I don’t think it’s his best role. He performs better standing up and he could play a Von Miller/Khalil Mack type role. If he is there at #9 somehow, NYG has to consider him strongly. Strong Points: Explosive pass rusher with the ability to reach the passer several ways. Explosive first step gives him the initial advantage. Turns the corner low and fast. Flexible hips allow him to explode from the lower half with plenty of strength. Violent tackler. Sends a jolt to his target. Can be stunted inside where he is just too quick and agile for the interior blockers. Consistent aggression, motor is always on. Pursues hard and fast, will make plenty of plays away from the line of scrimmage. Weak Points: Lacks the ideal build for a defensive end. Light in the pants. Does not anchor his position against the run right at him. Will over pursue and create cutback lanes for running backs. Does not recognize the trap blocks, won’t read the offensive line to get himself in position. Ineffective bull rush against his toughest one on one competition. Summary: Junior entry. Fourth year junior that has played on an incredibly talented defensive line all three years. Has been used as part of a rotation. Broke out in a big way in 2014 with 21 TFL and 12.5 sacks. Ray is ultra-talented from an athleticism perspective. He can beat blockers with straight line speed, change of direction, balance, leverage, and agility. He is a skilled player in addition, showing a variety of pass rush moves and routes to the quarterback. He may lack the ideal size, power, and strength for some schemes but plain and simple, he can reach the quarterback. His intensity and passion for the game should create even more opportunities for him to make plays. He may be somewhat scheme-specific but his impact in the NFL could be Pro-Bowl caliber. *I’ve been on Ray from the beginning. There are size and strength concerns here and you would be silly to not admit it. He in’t long, He isn’t thick. He doesn’t have a wide frame. What Ray has that others lack however is a level of explosion, speed, and aggression with pads on that others simply do not. Ray is a guy that will fight harder than the player assigned to block him every down of every game. While he struggles to anchor his position against straight ahead power blockers, Ray still has a presence. He delivers violent hits and pops to ball carriers. He can stifle offensive tackles in their tracks. Ray is a passionate player that finds ways to beat his man. Is he a 3 down player right away? Probably not. But the impact he can have on a game is enormous. He is worth the #9 pick. Strong Points: Gifted tools from frame and athleticism perspectives. Explosive out of his stance. Can get in to a blocker right away and initiate the engagement. Wide array of pass rush moves that seem refined and ready to go at all times. Really quick and powerful hands when using a swim or rip. Easy bender that can cut the corner of the edge with ease. Functionally strong, can turn speed in to power in a blink. Hyper-active athlete, motor is always on. Shows a passion for the game. Good tackler that uses his length to swallow the ball carrier. Defends the run well. Stays under the pads of his blocker to maintain and anchored position. Late and sudden movement to get off the blocks and in position to make the tackle. Weak Points: Shows the tendency to get locked on to when rushing the passer. Needs to add more generate more power from his base, doesn’t offer much as a bull rusher. Will over pursue and create cutback lanes. Won’t read the action and is often late to react. Missed all of 2013 with a hip injury. Summary: Has the talent and style of play to far exceed the production he put up in college. Odighizuwa has a blend of power, speed, and flexibility that is rare to come across. When he puts all of his tools together with his hyper motor, he can be a nightmare for a lone blocker to deal with. He needs to become a smarter player and learn to shed blocks when defending the run. If he can do that, there is a very high ceiling when looking at his potential. Starting-caliber defensive end here with a blend of everything one can ask for in a defensive end. *From the first game I scouted of Owam, I’ve felt this guy has the goods to be an elite pass rusher in the NFL. He has the get off, he has the easy flexibility, he has the hand power, he has the pass rush moves and most importantly the motor never turns off. The slight issue here is a hip problem that has hampered him in the past. Even though he’s been at full strength for almost two years now, there are medical reports out there that will dictate how far he drops. I did factor that in to his final grade and if it wasn’t in the picture, Owam would be one of my top 8 grades in the class. If he somehow fell in to round 2, he is a guy I would even consider trading up for from #40 overall. 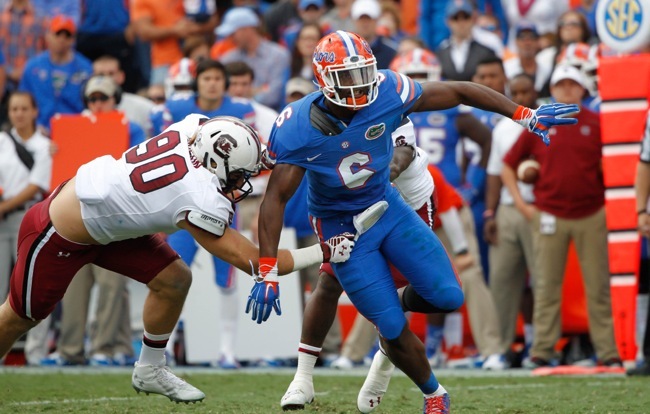 Strong Points: Explosive edge rusher that can accelerate quickly. Bends well and can sneak both by and under offensive tackles. Good uses of hands, he can use them with power and quickness. Can deliver a violent swipe on the move when a blocker tires to lock him up. Violent hitter and tackler. He can really make his presence felt when he reaches the ball carrier. Consistent aggression. Hustles across the field with top tier pursuit speed. Combination of pass rush moves can be called upon at any point. At his best from a pure speed rush stance, but he can rip/spin/uppercut his way to the inside shoulder. Developed upper body with explosive power in space. Weak Points: Lack of size, especially below the waist. Doesn’t fill the back side of his pants. In tight space, his strength and power appear to be on the weaker side. His impact play to play isn’t there. Doesn’t factor much against the run when it’s right at him. Struggles to control the engagement and get rid of blockers going right at him. Doesn’t break through the double team, nor does he anchor his position against them. Most likely not a fit for every scheme. Summary: Beasley is an All American and Clemson’s all time leading sack artist. His game is based purely on speed, quickness, and hustle. There are some developed skills to his game as well when it comes to pass rush moves of different sorts. His struggle, however, has always been and will likely always be strength-based. He is light in the pants and he struggles to hold up against the bigger blockers in traffic. Boom or bust type player that needs a scheme that will boost his strengths and really hide his weaknesses. Could end up being strictly a situational player at the next level. *Clemson was one of my main schools I was assigned to last summer, so I’ve seen pretty much every single one of Beasley’s games over the past two years. I was on him being a top 15 guy right away and I think there is still a shot he is the first edge guy taken. His get off and bend-ability are top tier. He has good upper body strength with powerful, quick hands and the foot speed of a wide receiver. Beasley is a pass rush specialist that will make tackles look downright silly, and good ones too. He is a hard guy to touch, let alone block out on an island. Are there concerns with his lower body strength and run defense? Absolutely. He isn’t a perfect, elite prospect. But the upside here may be the highest among all these guys. If NYG took him at #9, it could be the perfect fit for the role they have tried to create with much lesser athletes. Strong Points: Versatile pass rusher with the speed to rush the edge and the strength to rush the interior. Tough guy for blockers to move. Anchors his position against the run with a strong lower body and stiff arms. Sees the action and pursues the ball in traffic. At his best when bull rushing the inside shoulder of the offensive tackle. Gets out of his snap and hands on the blocker quickly. Wins a lot of battles post-engagement because of the initial hand and body position. Technically sound pass rusher. Creates matchup problems for any kind of blocker. Weak Points: Doesn’t have the initial jump out of his three point stance. Won’t win the battles with a blocker on athleticism. Tight-hipped and won’t show the wiggle and late movement. Takes too long and too many steps to change direction. Doesn’t get near the action enough, will disappear for long stretches within a game. Summary: First team all SEC defensive end that broke out in 2014 with a consistently productive season. Smith is a power rusher that displayed a developed and versatile skill set. He can be moved inside and out, exploiting matchup problems for the opposition. He gets to the passer a few different ways. His strength, and hand positioning allow him to rush between the tackles successfully but there is also a little pop to the outside that he can use when the offensive tackles lean to far inside. Smith has an ideal frame for the position and while there may be a slight athleticism deficit, he more than makes up for it with strength and consistent technique. *Every year I feel NYG is looking for their next Justin Tuck. It’s hard to find a defender with really powerful presence, easy quickness, and inside/out versatility that is created from a combination of refined skills and high-upside tools. Smith is that guy. I think NYG is going to have a VERY high grade on Smith. #9 pick? I don’t think so but he is going to be a guy that will move around to get on their team. Smith is a legit day one starter in a 4-3 scheme and the inside/out versatility he showed at Mississippi State would be a godsend for Spagnuolo. He’s lost about 15 pounds since his playing weight in college and the athleticism he has shown over the past few months leads me to believe this guy has Pro Bowls in his future. Strong Points: Explosive edge rusher that moves well with ease. Smooth athlete with the frame to put on bulk. Easy bender with freakish flexibility and quickness. Changes direction with balance and power. High effort player, works hard on the field to do the little things right. Uses a variety of rush moves to the outside. Diagnoses the blocker’s strategy and pounces on to where is vulnerable. Can explode off the snap from a three point stance or standing up starting position. Gets his hands inside with plenty of knee bend. Disciplined and patient pass rusher. Can set his man up and bounce off to accelerate past him. Finishes his tackles. Wraps up and drives to the ground. Weak Points: Has a thin and almost lanky frame. Lacks a power game. Doesn’t play the inside run well, struggles to get himself off the power blockers. Won’t drive tackles back as a bull rusher. Can be stifled easily when he rushes the inside shoulder. Needs to be in space to be effective, not a traffic player. Has had a laundry list of injuries in 2014 (knee, toe, foot, concussion) after missing time over the summer with a minor knee surgery. There are questions concerning his ability to physically hold up in the NFL. Summary: Gregory may be the top edge rushing prospect in this class. He has elite athleticism and the frame to put on more weight. He explodes off the snap and changes direction as if he were ice skating. He can bend his body in any direction at the snap of a finger. His struggles revolve around a lack of power and strength. He can be ineffective against the run to his inside shoulder and he won’t get much of a push. His long list of injuries need to be looked in to as well. The upside is huge but there are always players with this kind of situation that don’t pan out in the NFL, so buyer beware. *It’s easy to see what everyone loves about this player. Gregory has top tier flexibility and ability to move. He is so fluid and easy and there is more power behind him than one thinks. He needs to get stronger but I don’t think he necessarily needs to add 30 pounds. He can out-muscle several guys that outweigh hum by a lot. Gregory can be a top tier edge player in this league but the question that made me downgrade him by 3-4 points was the drug concern. I have a hard time thinking football is Priority A when you fail a drug test that you know is coming. The NFL is not taking this stuff lightly and he will be on their radar from day one. There is talent here but he isn’t head and shoulders above these other guys, I’d rather go with lesser off the field risk. Strong Points: Massive size from every perspective. Long and thick limbs. Can still bend well at the point of attack and can deliver as violent a punch as anyone in the nation. Shows the physical ability to dominate any matchup that is put in front of him. Has a suddenness to his game. Quick reaction and can move within a five yard window as fast as anyone. Makes the effort to get his pad level down. Can hold his ground at the very least, showing the short area power to get a constant push when he wants to. Explosive, hard hitting tackler that can put a ball carrier through the ground. Effective bull rusher with top tier driving power. Elite power presence with good and balanced footwork. Weak Points: Pad level is inconsistent. Ineffective when he exposes his chest, giving blockers a massive target to lock on to. Effort runs hot and cold. Will lose track of his mechanics and rely too much on his size and ability. Was not nearly as productive as his talent would indicate. Does not have a natural flow towards the action, spends too much time away from the ball. Summary: Junior entry. Played for the Oregon basketball team in addition for two years. Elite level tool set that has shown several flashes of being a rare player. Armstead is a big, thick body but moves like a basketball player. He has quickness, agility and grace in the open field. When his motor is on, Armstead can dominate anyone at the point of attack. His presence isn’t always felt on the stat sheet, but offenses will always need to know where he is. He is versatile enough to play on the outside of any scheme and could end up being an elite player if he continues to develop. *In January I talked about Armstead as a top 10 caliber guy with his blend of size, power, and short area explosion. I dove deeper in to his game and found there are a few maddening inconsistencies but at his best, I think he is better than Leonard Williams. At almost 300 pounds, he can athletically handle 4-3 DE responsibilities as a pass rusher and simply dominate against the run. When his technique and effort were on, he was tossing blockers around like rag dolls. For the most part Armstead plays hard and physical and he would add a versatile option to this defense that could make an enormous difference on this defense. His long term upside can be discussed with the best young names in the game. * I do think the talks about him being a top 10 pick are real. I don’t want to claim to be on the inside but I keep hearing from people I trust that there are 3 teams in the top 10 that want him. Time will tell. I think it is a common, but rarely ever successful, situation where the guy has some explosion on tape and puts together a top tier workout which leads to an overly high grade. He does have a nice get off and there is above average flexibility, but I don’t see a guy that is going to consistently win the one on one battles. He’ll get his share and I do have him graded as a 2nd rounder, but I don’t see the special in him. He gets locked on to and struggles to disengage. I don’t see any bull rush ability. I see a guy that dances around too much. Can he fit in to a 4-3 DE role? Sure, but ideally you get a guy with better urn defense for the level of production he will offer as a pass rusher. Strong Points: Savvy edge rusher. Understands how to set up blockers throughout a game. Can dip and change direction with a natural flow. Explosive off the snap. Good body control and awareness. Pursues well, often found near the action. Strong tackler with good mechanics and power presence. Aggressive, high motor athlete that will make plenty of plays based on hustle alone. Understands how to use his length to his advantage. Will play with a low base and high hands. Can anchor his position against the run and get off blocks with quick, last second movement. Long strider in space. Weak Points: Lacks a bull rush type presence to his game. Doesn’t push blockers back in to the pocket. Would rather dance around a blocker than drive through him. Lacks awareness and experience in coverage. Doesn’t play with his head on a swivel, will be tricked by blocking schemes involving traps and counters. Needs more strength and girth. Summary: Mauldin is a tools-rich edge rusher with experience as a 4-3 DE and a 3-4 OLB. He is a comfortable athlete with plenty of ability to change direction in a small box and work his way to the pocket. He was used in a variety of ways at Louisville, constantly changing sides of the line, playing standing up and with is hand in the dirt, and rushing inside and outside shoulders. Very easy bender with short area pop. Mauldin will need to add strength and power to his repertoire but he is a natural, savvy edge player with the tools to be an effective player early on in his career. *I struggled with the decision of Mauldin being a LB or DE/Edge. He played both at Louisville and he is the one guy on this list that is actually a factor when he drops back in to coverage. I’ll keep him here for now. Mauldin is a smart, smart player that can get himself in position to make plays quicker than others. There is legit talent here too. He can be explosive on one play, bull rush on the next, and use one of his refined moves after. He has a nose for the ball. He reminds me of DaMontre Moore in college actually. He can fit in to this scheme a few different ways. Strong Points: Long and wiry strong type frame. Bends exceedingly well and is often found being the low man between him and the blocker. Quick and explosive out of his stance. Shoots the gaps well. Keeps his body low and strong hands in front. Works hard to get the inside position. Sheds blocks consistently and will get near or in on the action often. Wide array of rush moves. Rip, swim, and uppercut are all well developed. Accelerates hard within a short space. Shows tackle to tackle range. Good tackler, wraps up hard and aggressively finishes. Has surprising ability to speed rush the edge and turn the corner. Can hold the point and get rid of the blocker after diagnosing. Very good instincts and reaction. Weak Points: Gets driven back by the double team. Once he gets stood up he has a hard time holding his position. Limited speed in the open field, lacks the extra gear in pursuit. Won’t explode in to the blocker and deliver a violent jolt. May have a limited power output at his current weight. Missed 6+ games in 2013 with a knee injury. Summary: Fifth year senior with a lot of starting experience. Anderson is moved all over the line because of his versatile skill set. With his height and length, he can be a weapon between the tackles to combat the short, quick passing game with his ability to cloud the throwing lanes. There is also a good amount of flexibility and quickness that makes him a very good one-gap rusher. His reach for the blocker off the snap allows him to control the engagement and his skill set of shedding blocks while maintaining body control allows him to get in on a lot of action. High upside, versatile player that can wear a lot of hats. *During the season I thought I would have Anderson graded as a first rounder. Once I started to really break him down, I found more holes in his game but I still think he can be a versatile difference maker in a 4-3. Some label him as a 3-4 only guy, and I wholeheartedly disagree. He would fit perfect as a LDE that shifts inside on passing downs. He is a classic pass rusher that can be too quick for power blockers, but too strong for the fast-footed blockers. At 6’6+, Anderson plays with a really low pad level and considering he has almost 300 pounds on that frame, he is simply a tough guy to block in any situation for any blocker. He lacks the superstar ceiling, but Anderson is the kind of guy that wins games. Every winning team as an Anderson on their team. *Maybe the player I was impressed by the most at the Senior Bowl. Orchard lacks size and strength below the waist, but he was consistently productive against the run and pass. He is crafty more than he is talented but he showed a good combination of tools and skills against some stiff competition. He gave Peat, an OT I really respect, a headache for a few plays in their matchup. *I remember watching Harold play in October and saying that was gonna be a guy I couldn’t wait to scout next year. He just looked like an NFL edge guy. I was surprised to see him come out early and I think he could have been a top 10 guy after another year of college football. I scouted him after the season and comparing him to the top edge guys on this list, he just isn’t on their level. He has good get off by the lacks hand strength and won’t disengage from blockers. There are a couple pieces missing but he is still a guy I think has the upside to be an impact player down the road. *There are a few guys telling me Edwards is going to be a 1st round pick. That may be the case but I think he is a day 3 guy. Edwards will be a solid role player with a high floor, you know what you are getting with him. He is big and powerful, can defend the run. Even has some surprising ability to move in space but there isn’t the quick twitch. I don’t see him as a pass rush factor or a guy that disrupts the backfield. Solid but unspectacular. *I’ll tell you what, Golden was one of my favorite players in the nation this past year to watch. He is a mean, mean dude that has muscles growing on muscles. I want to grade him higher but he is lacking in several physical traits that are really important. He is short and he lacks length. He isn’t fast and he isn’t explosive. In the NFL, that’s a combination of weaknesses that rarely works out. But I will still put a 4th round grade on him and he is guy I would welcome with open arms at that point. He plays as hard as anyone and he will be good for physical presence and intensity, if nothing else. *Prime example of two players with the same grade but they leave a different taste in my mouth when looking at Hunter and Golden. Hunter is a guy I don’t like right now, but he is blessed with a tool set that can be developed in to superstar status. He has height, length, strength, speed, explosion, and flexibility. Those are important check marks. Hunter wasn’t productive at all in college but you can’t deny his upside. He is a multi-year project that I think will be drafted way before I would consider him an option for NYG. *At first glance he is a ‘nothing special’ guy but the more you watch, the more football player you see in him. He is a coach’s favorite and if NYG is still on their obsession with team captains and top tier behavior off the field, Flowers is a guy that may want. He isn’t tall but he is long and he plays with a low pad level, tough guy to lock on to. He’s smart and he plays hard, there are some interesting tools here to work with. Limited upside but he could be a niche guy. *Interesting guy here that some people I respect are very high on. He was in a tough spot at Miami, playing a 3-4 DE role and even shifting inside at times. He couldn’t display his combination of tools and skills until the pre-draft process, one he did very well with. I think NYG will be attracted to a guy like this, similar to the way they liked David Tollefson a few years back except Chickillo has more talent. *Overlooked prospect by many but I think there will be a few teams with a high grade on him. Teams with hybrid fronts may even have a 3rd round grade on him. Ifedi excels once he engages with the blocker. He has quick feet and strong hands with long arms, making hum a tough guy to lock up. He isn’t explosive but he is crafty and times his reactions and movements well. *Classic example of a guy that that had a productive, All-American type season and the draft community got too high on and immediately put him in the 1st round. I think I even saw one of the ESPN guys put him in the top 10 at one point. That has subsided and bit and I think he ends up exactly where I always thought he would, day 3. I love the energy/motor/aggression he brings to the table. He doesn’t have a power presence though and he won’t out-move NFL OTs. He can be a special teams weapon and situational guy at best. Not sure this guy can hack it as a 4-3 DE, as I just don’t see the body type. But if NYG can create a role for a situational pass rusher from a LB type spot, Wagenmann is worth a day 3 look. At a lower level of college football, he looked like Clay Matthews with his explosion off the ball and relentless pursuit of the action. He is a physical guy that had a nice showing at the NFLPA Collegiate Bowl. Yes that height is correct and yes some people won’t even look at him as a DE. If you want to see Iowa OT Brandon Scherff struggle, go watch him matched up against Monroe. Monroe is the all time sack leader at Maryland and he is a guy that makes any kind of blocker work extra hard from start to finish. I think this is a kid that will fight his way on to a roster and surprise people. From the early fall, I have viewed these edge prospects as a really strong and deep group. There are plenty of guys that fit the mold of an explosive speed rusher and plenty of guys that can play the every down role. I think there is a legit shot we see 5 of these kids go in the top 10 overall. If you miss out on one of the top guys, there will be plenty of options to go after an upside player in the rounds that follow. The main issue, however, several teams will be looking for edge help. It’s become such a high demand role, even for the teams that are considered to be strong there already. My issue with NYG when it comes to pass rush is simple. I feel they have been hindering themselves from improvement by only targeting specific players that fit the traditional 4-3 DE roles. Guys that have to be a certain height/weight/length. Well, this year those guys simply are far and few between while there are several players that can help this team be more productive against the pass. I want NYG to be more innovative with their view and implementation of edge rushers in to their scheme. If they don’t select a Beasley, or Ray, or Fowler simply based on size and the traditional 4-3 DE “needs”, it will bother me. Hopefully Spags learned a thing or two in Baltimore about tweaking a system based on personnel. NYG has a decent group of DEs right now but who knows where JPP will be in a year and the adage remains, you can never have enough pass rushers. I would love to see NYG bring in one of those first 10 names I discussed.